Get your art on with the Create and Make Workshop Series! Wish you could pull up and give way to creative abandon from time to time? Look no further: The Create and Make Workshops are here and are guaranteed to be tons of adult-creative fun! 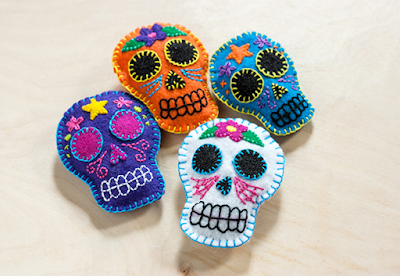 Participants will create and design a colorful Sugar Skull or Calaca cushion. You will learn basic stitching / embroidery techniques and use felt and fabrics. Cushions will be decorated with sequins, buttons, ribbons and other materials. While participants create their own work, Amaranta will share traditions around the Dia de Los Muertos celebration in Mexico. The workshop will take place on Wednesday, October 10, and is held from 6:30 – 8:30pm in the Shoreline/LFP Senior Center, 18560 1st Ave NE, Shoreline, WA. Want more creative adult fun? Check out the other Create and Make Workshops this season!